Bright Comet ISON: Will It Sizzle or Fizzle This Year? This still from a NASA video identifies comet C/2012 S1 (ISON), better known as Comet ISON, in a telescope image. 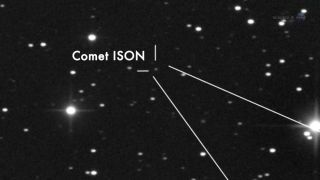 The newly discovered Comet ISON is just a faint speck in the sky right now, but later this year, when it flies closer to the sun, it could shine as bright as the moon and may even be visible in broad daylight, scientists say. "Comet ISON is a sungrazer," comet-tracker Karl Battams of the U.S. Naval Research Lab said in a NASA statement. "The orbit of the comet will bring it very close to the sun, which we know can be a spectacular thing." That apparition, if Comet ISON delivers on its promise, is expected to peak in late November. While some astronomers a have touted ISON as a potential "Comet of the Century," there is still some uncertainty on how bright the object will actually become, according to scientists with NASA and other observatories. Comet Nevski-Novichonok (ISON) as it may appear at sunset on Nov. 29, if it survives its close encounter with the sun the day before. Russian astronomers Vitali Nevski and Artyom Novichonok discovered the comet in September 2012 using a 15.7-inch (0.4-meter) reflecting telescope of the International Scientific Optical Network (ISON), near Kislovodsk. They predicted that at its closest point to the sun, which occurs on Nov. 28, 2013, the comet will come within 800,000 miles (1.2 million km) of the sun's surface and could transform into a dazzling night sky object with a long, dusty tail. But that's only if the Comet ISON manages to survive its fiery flyby — it could be destroyed by tidal forces or solar radiation as it approaches the sun, scientists say. "I'm old enough to remember the last 'Comet of the Century,'" said Don Yeomans of NASA Near-Earth Object Program. Yeomans was referring to a distant comet named Kohoutek that promised to put on such a show in 1973, but turned out to be a bust. "It fizzled. Comets are notoriously unpredictable." Knight, however, noted that an object smaller than C/2012 S1, Comet Lovejoy, put on a stunning display after it soared through the sun's atmosphere in 2011 and emerged intact on the other side. "Comet ISON is probably at least twice as big as Comet Lovejoy and will pass a bit farther from the sun's surface" Knight said. "This would seem to favor Comet ISON surviving and ultimately putting on a good show." Another possibility, astronomers said, is that Comet ISON could break apart, which could give it an appearance akin to a cosmic string of pearls when viewed through a telescope. Yeomans assured that such a scenario would not pose a threat to Earth. "Comet ISON is not on a collision course," he said. "If it breaks up, the fragments would continue along the same safe trajectory as the original comet." Editor's note: If you have an amazing picture of Comet ISON or any other night sky view that you'd like to share for a possible story or image gallery, send photos, comments and your name and location to managing editor Tariq Malik at spacephotos@space.com.